For the opening of the first New York City boutique of this famous Parisian brand, below, creative consultant Ines de la Fressange spent months tracking down just the right mixture of modernist furniture and fine art (check out the Picasso drawing upstairs) and just the right color of blush pink wall paint to evoke the eclectic style and warmth of the Parisian apartment that shoe designer Roger Vivier once inhabited. The way the brand's iconic Belle Vivier buckle shoes are selling in this boutique, De la Fressange could have just put up some Ikea shelves. Women hankering for the fancy footwear don't even notice the decor, they're so hot for the patent-leather shoes. Mixed in with the '50s-style settee are a few pieces designed by jeweler Herve van der Straeten and a pair of Napoleon III-era commodes. 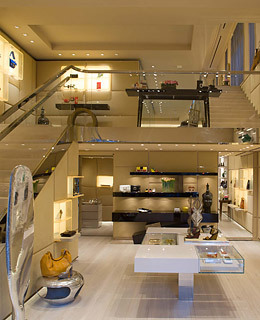 The overall effect is more private home than luxury emporium, and that is exactly De la Fressange's intention. "Luxury in all its forms should always be special," she says. Something the designer of these sought-after shoes, Bruno Frisoni, certainly knows well.